NASA Johnson Personal Rescue Enclosure escape ball - suited astronaut would move it from shuttle to shuttle. American manned rescue spacecraft. Study 1984. The Personal Rescue Enclosure (PRE) Rescue Ball was an 86 cm diameter high-tech beach ball for transport of astronauts from a spacecraft in distress to the space shuttle. AKA: Personal Rescue Enclosure;PRE. Status: Study 1984. Height: 0.86 m (2.82 ft). Span: 0.86 m (2.82 ft). 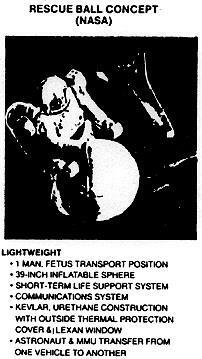 Crew members were to climb into the ball, assume a fetal position, and be zipped inside by a space suited crew member. Before the Challenger disaster, shuttle crews wore no space suits. This presented the problem of how to move them from one shuttle to another - if - it was possible to launch a rescue mission before the supplies aboard the stranded shuttle ran out. To address this problem, Johnson Spaceflight Center devised the most minimal spacecraft of all time - the Personal Rescue Enclosure (PRE) Rescue Ball. The rescue ball was an 86 cm diameter high-tech beach ball with three layers: urethane inner enclosure, Kevlar middle layer, and a white outer thermal protective cover. Crew members were to climb into the ball, assume a fetal position, and be zipped inside by a space suited crew member. They donned an oxygen mask and cradled in their arms a carbon dioxide scrubber/oxygen supply box with one hour worth of oxygen. The ball would be connected by an umbilical to the shuttle to supply air until the airlock depressurized. 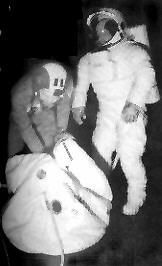 The crew member would then be floated over to the rescue shuttle by the suited astronaut. The process would be repeated until the entire crew was moved from one spacecraft to another. Crew Size: 1. Habitable Volume: 0.33 m3. Family: Space station orbit. Country: USA. Agency: NASA, NASA Houston. Bibliography: 418. NASA Johnson Personal Rescue Enclosure escape ball - getting in. 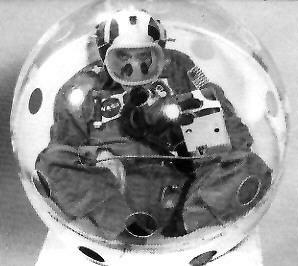 NASA Johnson Personal Rescue Enclosure escape ball - unhappy camper inside transparent demonstration version. The real version had a white cover with only a tiny porthole to prevent claustrophobia. 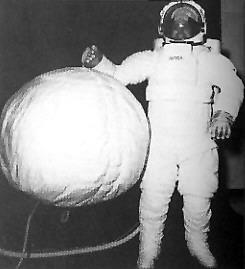 The original NASA Rescue Ball concept was a little bigger then than the Personal Rescue Enclosure that was finally built.